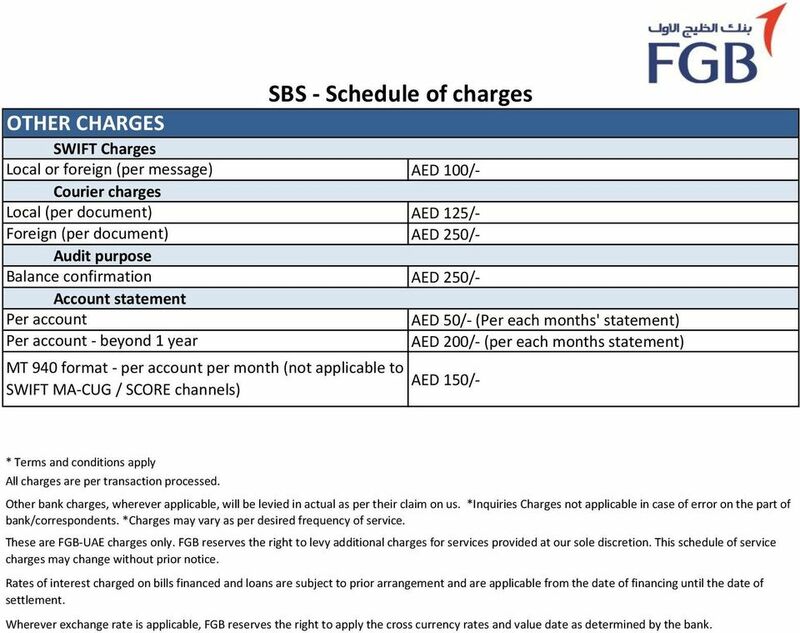 Download "SBS - Schedule of charges"
6 OTHER CHARGES SWIFT Charges Local or foreign (per message) Courier charges Local (per document) Foreign (per document) Audit purpose Balance confirmation Account statement Per account Per account - beyond 1 year MT 940 format - per account per month (not applicable to SWIFT MA-CUG / SCORE channels) AED 125/- (Per each months' statement) (per each months statement) AED 150/- * Terms and conditions apply All charges are per transaction processed. Other bank charges, wherever applicable, will be levied in actual as per their claim on us. *Inquiries Charges not applicable in case of error on the part of bank/correspondents. *Charges may vary as per desired frequency of service. 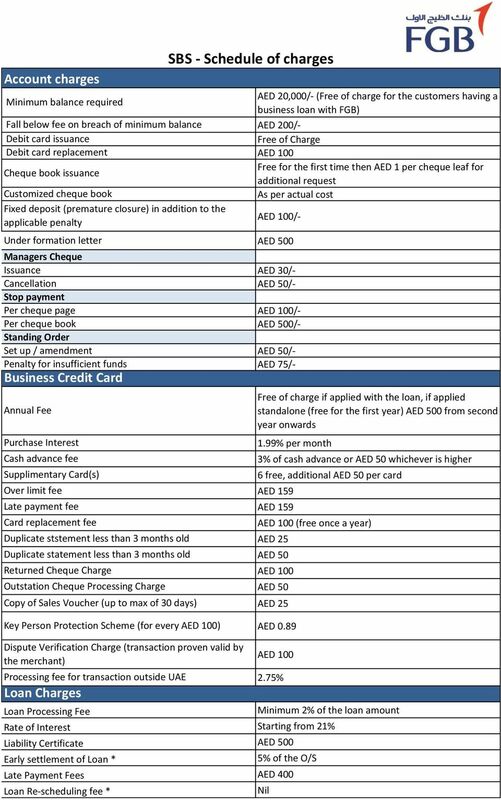 These are FGB-UAE charges only. FGB reserves the right to levy additional charges for services provided at our sole discretion. 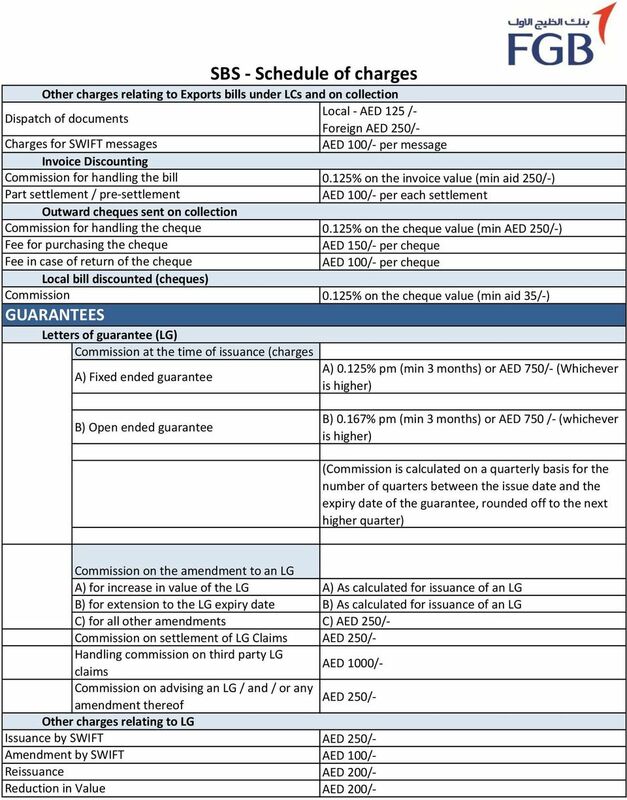 This schedule of service charges may change without prior notice. Rates of interest charged on bills financed and loans are subject to prior arrangement and are applicable from the date of financing until the date of settlement. Wherever exchange rate is applicable, FGB reserves the right to apply the cross currency rates and value date as determined by the bank. 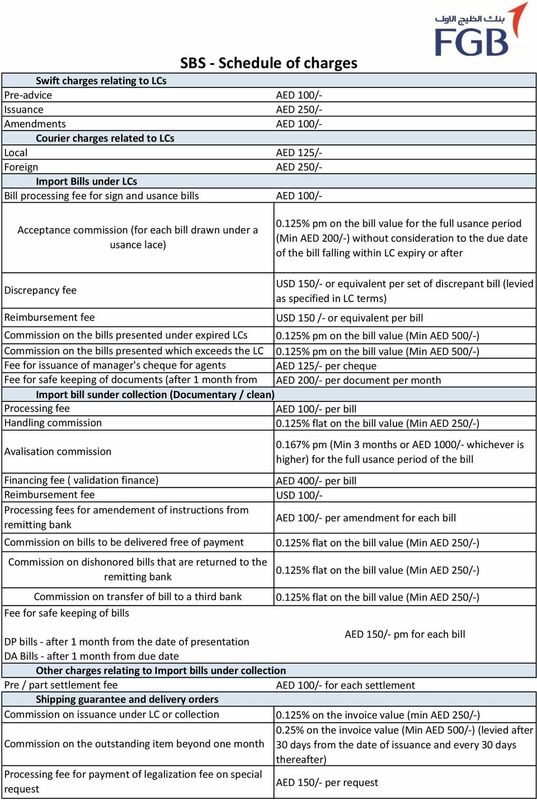 HSBC Qatar Corporate Tariff and Charges Effective 1 June 2015 Version 1-1 June 2015 Issued by HSBC Bank Middle East Limited, P. O. Box 57, Doha, Qatar, which is incorporated in Jersey, Channel Islands. 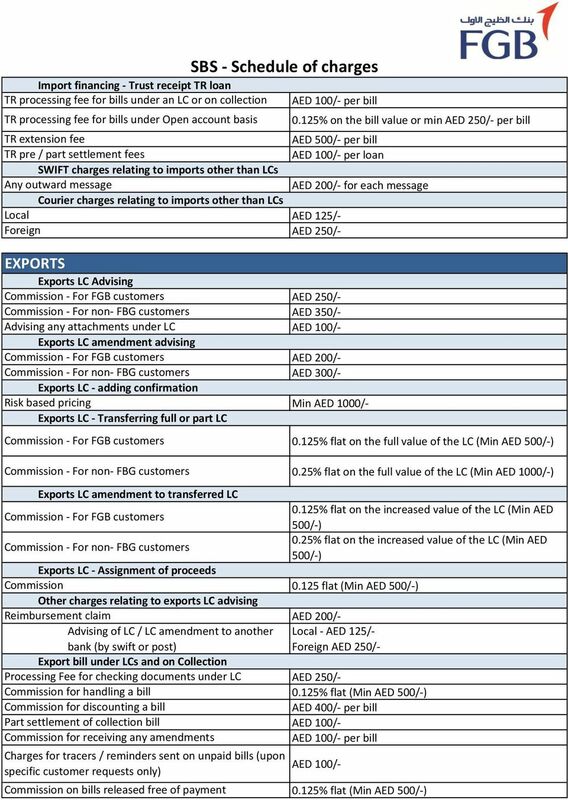 FEES & CHARGES FOR FOREIGN CURRENCY BUSINESS A) IMPORTS 1. Issuance of Documentary L/C 0.25% on 1 st USD50,000.00 0.125% on balance in excess of USD 50,000.00 Minimum USD50.00 Cable charge USD60.00 2.
. 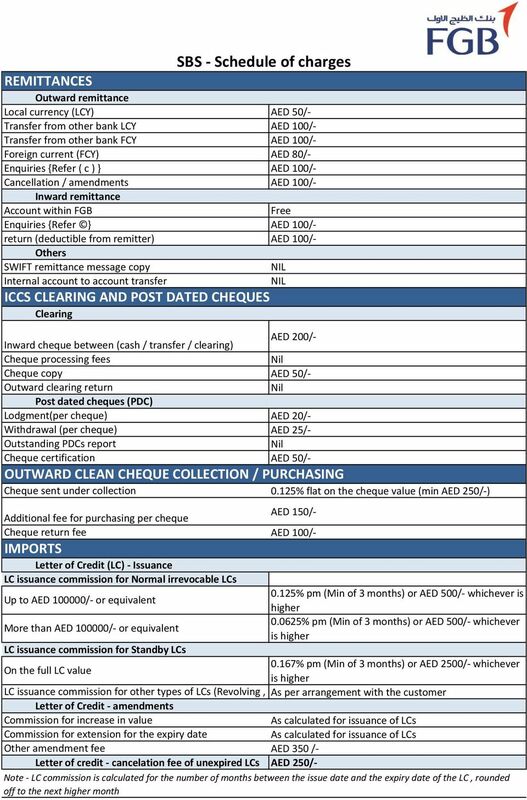 This booklet lists the tariff and charges for transactions and services offered by The Hongkong and Shanghai Banking Corporation Limited, Offshore Banking Unit Labuan (Licensed Labuan bank, Licence No. Commercial Bank Tariffs 2015 Effective from 1 January 2015 Issued by The Hongkong and Shanghai Banking Corporation Limited, which is incorporated in the Hong Kong SAR with limited liability. Content 1. TERMS and CONDITIONS Applicable to Foreign Correspondents Issue April 4th, 2012 These Terms and Conditions supersede all those previously issued and are subject to change at any time without prior notice. 1. OPENING OF BANK ACCOUNTS 1.1 Current accounts 1.2 Escrow accounts 1.3 Joint accounts 1.4 Time deposits 1.5 Other special accounts 1.6. Minimum balance 1.7.Examination of documents for p 1.2, 1.5 2. Minimum / Maximum charge. Quarterly, on the daily balance of the unutilised balance of the loan. 5.4. Over EUR 500 1.00%; min.rsd 1,000 max.rsd.15,000 6. PAYMENT IN FOREIGN CURRENCY 6.1. With coverage in foreign currency 0.07% min. Corporate Banking Services Tariff of Accounts and Services - - Effective Date: OCT 05 Corporate Banking Services Tariff of Accounts and Services GOVERNMENT PRICING and GOVERNMENT-GUIDED PRICING ITEMS No.